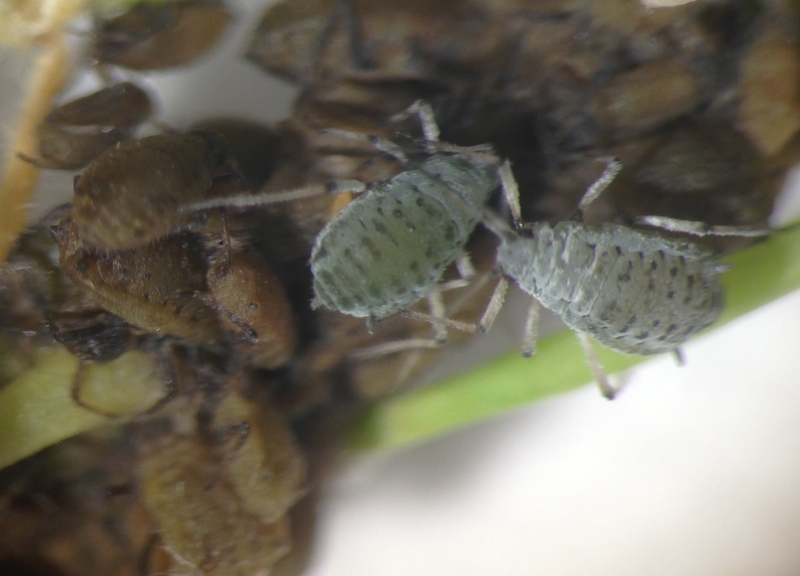 The cabbage aphid (Brevicoryne brassicae) on broccoli and the western flower thrips (Frankliniella occidentalis) on lettuce are important pests which require regular insecticidal treatments. Thrips feeding causes scarring on lettuce. They also transmit viral diseases. 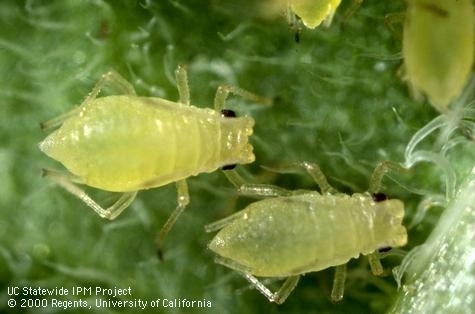 Cabbage aphids can affect plant growth or kill the plants at high pest densities. Presence of the aphids on harvested broccoli reduces the crop value. The green peach aphid (Myzus persicae) is also a frequent pest of broccoli, but is less important because it feeds mostly on older leaves. Broccoli and lettuce pests are typically managed using chemical pesticides in California and there is a continuous need for evaluating the efficacy of existing and new pesticides. Different species of aphids and western flower thrips are known to develop resistance to various insecticides around the world and the risk is especially higher for the latter (Devonshire and Moores, 1982, Immaraju et al., 1992, Jensen, 2000). Successful IPM involves rotation of insecticides with different modes of action and alternating with non-chemical options to reduce the risk of pesticide resistance. Entomopathogenic fungi such as, Beauveria bassiana are pathogenic to thrips (Brownbridge et al., 2000, Murphy et al., 1998) and could be good candidates for pest management. But information on the efficacy of B. bassiana for vegetable pest management in California Central Coast is lacking. Field trials were conducted in 2011 and 2012 to evaluate the efficacy of existing, newly registered, and experimental insecticides. In the 2012 trials, a commercial formulation of B. bassiana was also evaluated. 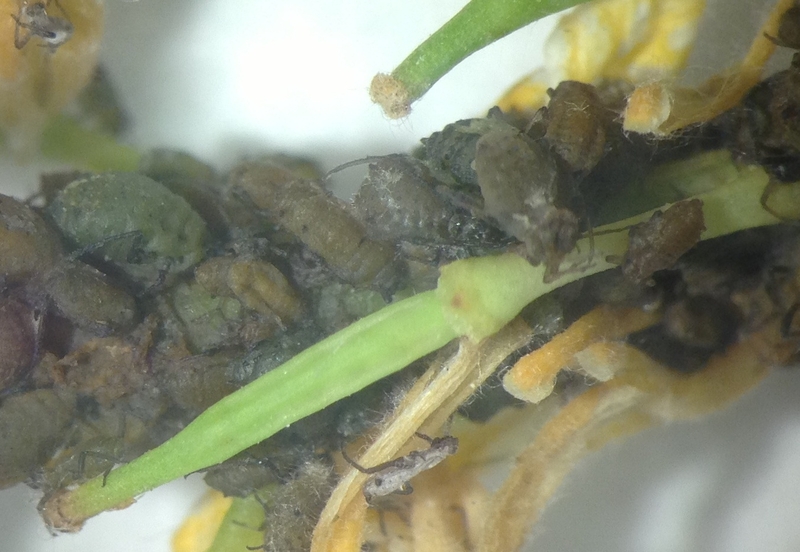 Aphids on broccoli: A trial was conducted in a commercial broccoli field in Santa Maria in 2012. The field was planted in cultivar Beneforté on July 31. Each plot was 20' long with 5 rows of broccoli replicated four times in a randomized complete block design. Treatments included an untreated control, acetamiprid (Assail, 4 oz/ac), B. bassiana (BotaniGard, 2 lb/ac), tolfenpyrad (Torac, 21 fl oz/ac), an experimental insecticide, pyrifluquinazon (3.2 flo oz/ac), NNI-1171 (21 fl oz/ac), and a new insecticide, sulfoxaflor (Closer) at two rates (1.5 and 2 fl oz/ac). All treatments were applied using a CO2-pressurized backpack sprayer with three flat fan nozzles. A spray volume of 50 gal/acre was used for all, but B. bassiana which had 100 gal/ac. A non-ionic surfactant was included at 0.1% (v/v) concentration for acetamiprid, 0.125% for B. bassiana, and 0.25% for the rest. Treatments were initiated on September 5 and repeated on September 25. 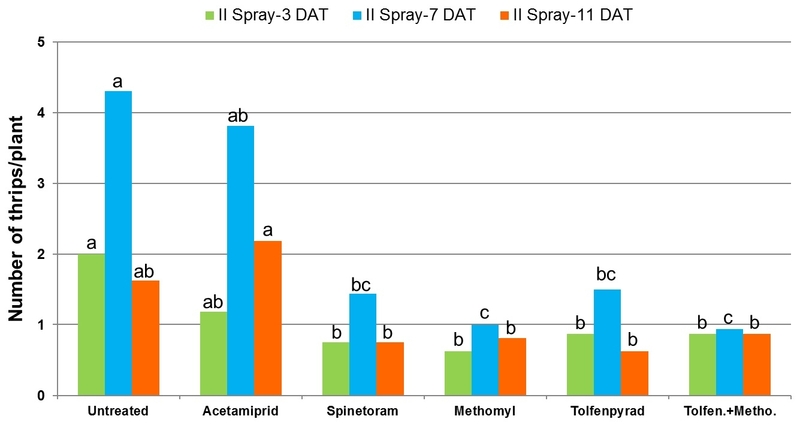 Green peach and cabbage aphids were counted on five randomly selected plants per plot prior to the first application and 3, 7, and 12 or 13 days after each spray application. On each observation date, sample plants were pulled out and the number of aphids on each leaf was counted. Analysis of variance was used to analyze data and significant means were separated using Tukey's HSD test. 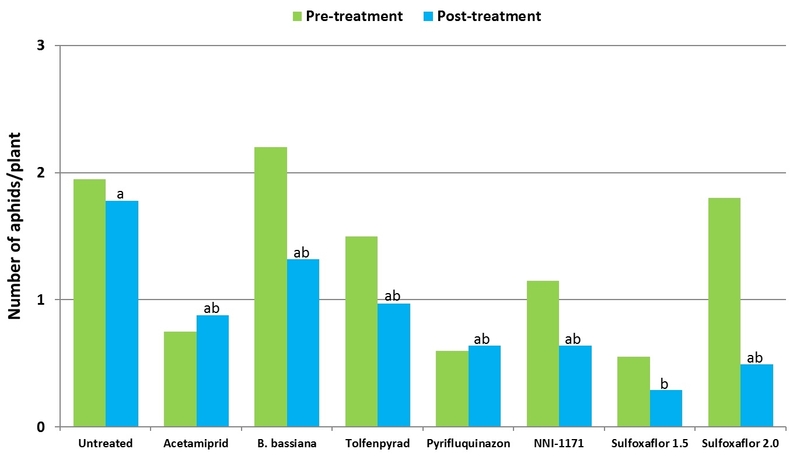 Mean number of cabbage and green peach aphids (combined) from six observation dates after treatment compared to pre-treatment numbers. Data for the green peach and cabbage aphids were pooled together to compare treatments. 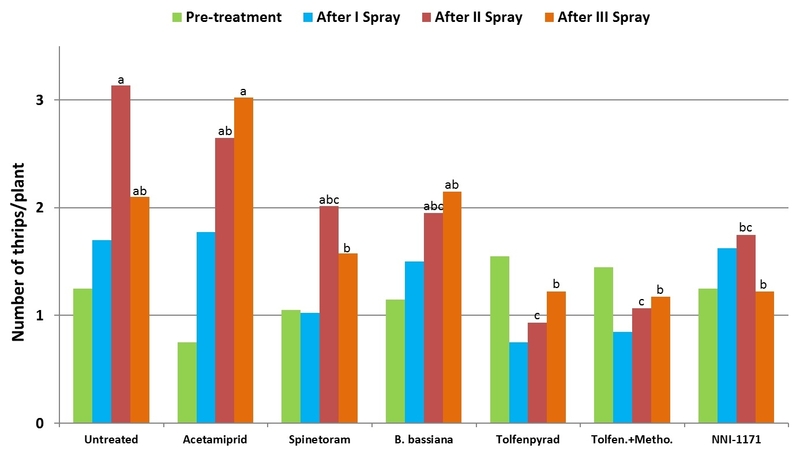 Significant differences (P < 0.05) among treatments could be seen only 3 and 7 days after the first spray application and 3 days after the second application. 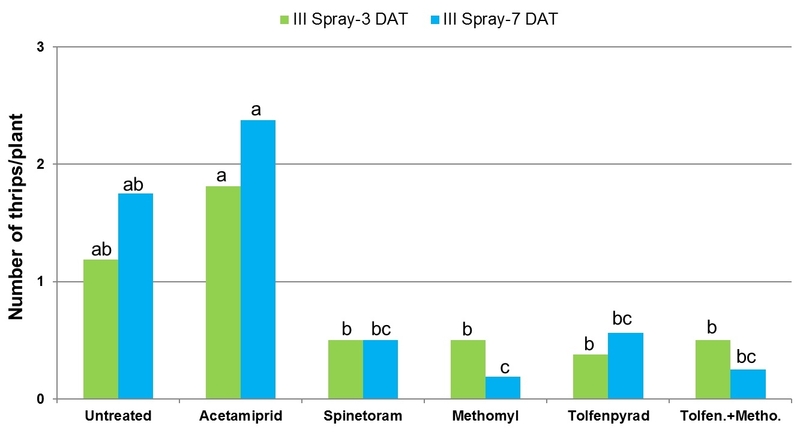 Efficacy of different products varied across the sampling period, but there was a general reduction in aphid populations in treated plots. Although aphid numbers in B. bassiana-treated plots were similar to untreated control during the first spray application period, fungus provided good control comparable to chemical insecticides following the second application. This kind of delayed response is sometimes common with biopesticides as infection process can take time. 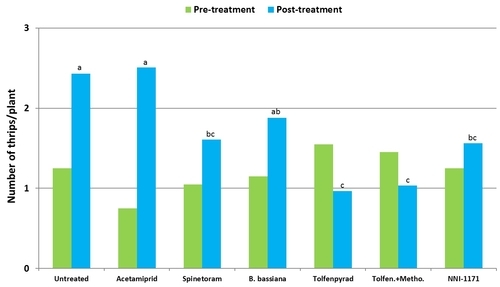 But providing control similar to chemical insecticides during the latter part of the study is impressive for an entomopathogenic fungus and demonstrates the potential of B. bassiana in IPM. 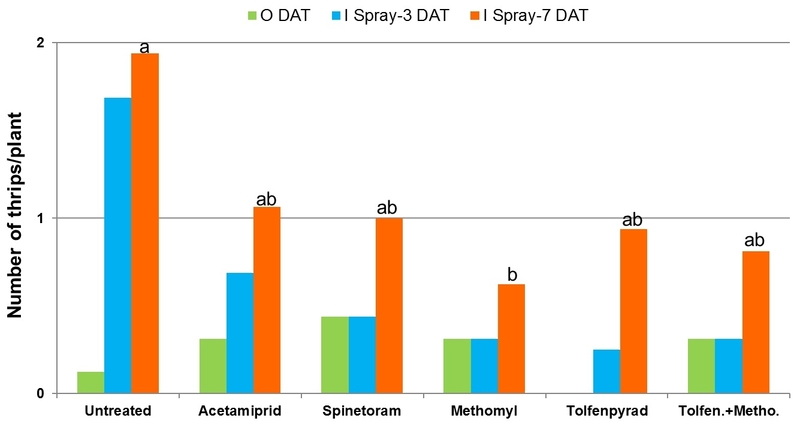 Mean number of cabbage and green peach aphids (combined) from three observation dates after each spray application compared to pre-treatment numbers. 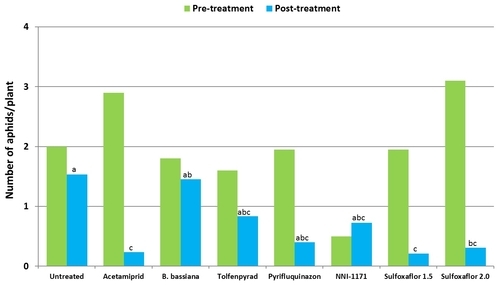 When post-treatment averages were considered for individual aphid species, significantly lower (P < 0.05) number of green peach aphids compared to untreated control were seen in plots treated with the lower rate of sulfoxaflor. Mean number of green peach aphids from six observation dates after treatment compared to pre-treatment numbers. In the case of cabbage aphids, acetamiprid and the lower rate of sulfoxaflor had significantly lower (P < 0.01) numbers. 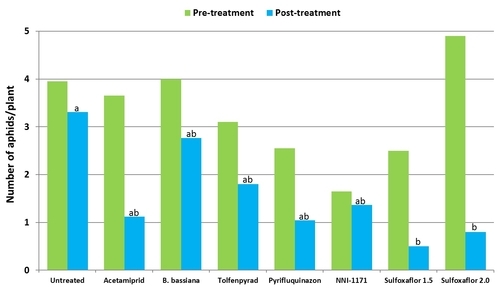 Mean number of cabbage aphids from six observation dates after treatment compared to pre-treatment numbers. 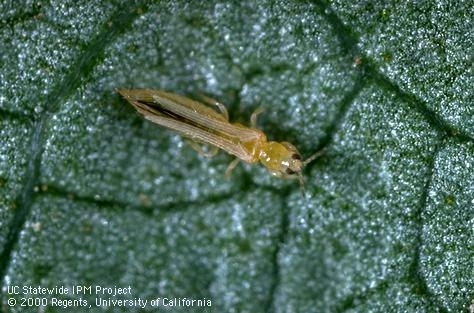 Western flower thrips on lettuce: Trials were conducted in commercial lettuce fields in Lompoc. Each plot included a 10' long bed with 5 rows of lettuce and arranged in a randomized complete block design with four replications. Insecticides were applied using a CO2-pressurized backpack sprayer equipped with three flat fan nozzles that covered the entire bed. A spray volume of 50 gallons/ac was used for all treatments except for B. bassiana which had 100 gallons/ac. Number of thrips were monitored before and 3, 7, and 12 days after treatment by sampling five random plants using a beat pan and sticky cards. Data were summarized by analysis of variance and significant means were separated using Tukey's HSD test. 2011 – A lettuce field was planted in cultivar Durango on June 8. Treatments included an untreated control, acetamiprid (Assail, 1.7 oz/ac), spinetoram (Radiant, 7 fl oz/ac), methomyl (Lannate, 0.75 lb/ac), tolfenpyrad (Torac, 21 fl oz/ac), and a combination of tolfenpyrad and methomyl. Non-ionic surfactant was used with all treatments at 0.25% v/v rate. Treatments were administered on July 16, July 22, and August 3. Average number of thrips per plant gradually increased towards the middle of the observation period and declined towards the end. Significant differences (P < 0.05) among treatments appeared following 7 days after the first spray application. 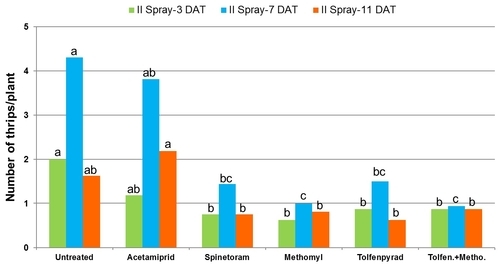 Number of thrips in different treatments after each spray application. 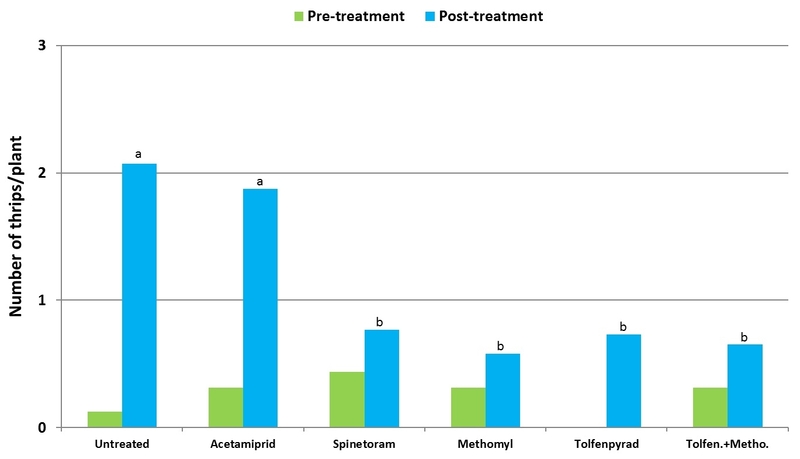 In general, spinetoram, methomyl, tolfenpyrad, and the combination of tolfenpyrad and methomyl caused significant reduction (P = 0.0001) in thrips during the experimental period. 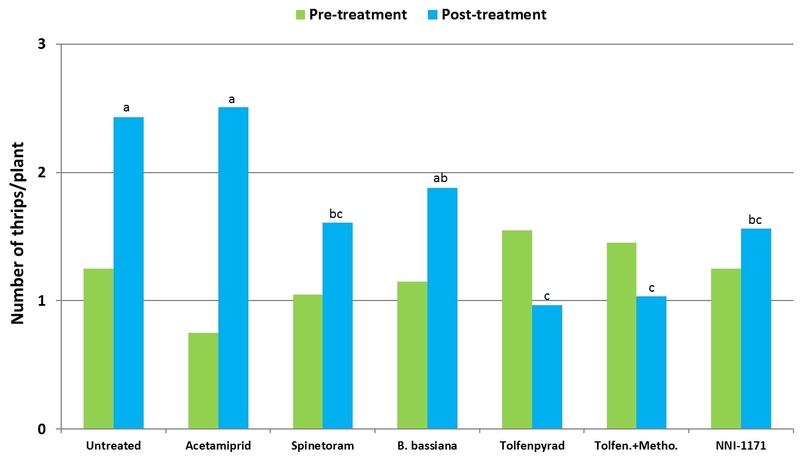 Mean number of thrips before and after treatment (average for seven observation dates). 2012 – Field was planted in cultivar Vandenberg on April 6. Treatments included an untreated control, acetamiprid (Assail, 4 oz/ac), spinetoram (Radiant, 8 fl oz/ac), B. bassiana (BotaniGard, 2 lb/ac) methomyl (Lannate, 0.75 lb/ac), combination of tolfenpyrad (Torac, 21 fl oz/ac) and methomyl (0.75 lb/ac), and an experimental insecticide currently referred to as NNI-1171 (21 fl oz/ac). Non-ionic surfactant was used at 0.1% v/v rate for acetamiprid, 0.125% for B. bassiana, and at 0.25% for the rest. Treatments were administered on May 16, May 24, and June 6. 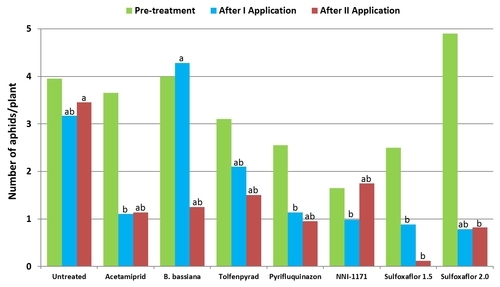 Number of thrips was similar before the initiation of the experiment with a general decline after the first spray application. Thrips populations increased thereafter. 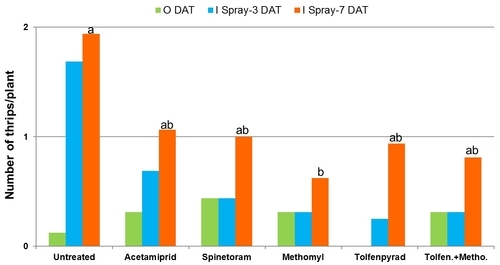 Significant differences (P < 0.05) among treatments were observed during the last four sampling dates, but they were more pronounced on 7 and 12 days after the second spray application and 3 days after the third application. 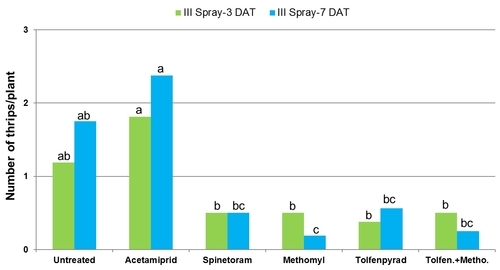 Mean number of thrips before and after each spray application. Plots treated with tolfenpyrad alone and in combination with methomyl had a significantly lower (P < 0.0001) number of thrips compared to untreated control when post-treatment average was considered. Plots treated with spinetoram, B. bassiana, and NNI-1171 had a similar number of thrips during this period. 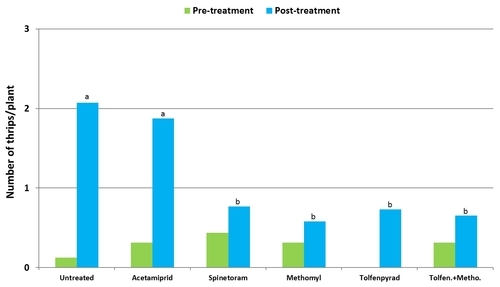 Conclusion: These studies demonstrate that several new and existing insecticides can be considered for managing aphids on broccoli and western flower thrips on lettuce. The entomopathogenic fungus, B. bassiana also shows promise as an environmentally safe alternative to chemical insecticides. Disclaimer: Refer to the label for current registration status before using any product. Acknowledgements: Thanks to Frank Costa (Ocean View Flowers, Lompoc) and San Ysidro Farms, Santa Maria for their valuable collaboration on these trials. I would also like to thank Dow AgroSciences, Nichino America, and United Phosphorus for their financial support. Brownbridge, M., M. Skinner, B. L. Parker. 2000. Enhancing the activity of insect-killing fungi for floral IPM. Ohio Florists' Association, Bulletin No. 842, 14–16. Devonshire, A. L. and G. D. Moores. 1982. A carboxylesterase with broad substrate specificity causes organophosphorus, carbamate and pyrethroid resistance in peach-potato aphids (Myzus persicae). Pesticide Biochem. Physiol. 18: 235-246. Immaraju, J. A., T. D. Paine, J. A. Bethke, K. L. Robb, and J. P. Newman. 1992. Western flower thrips (Thysanoptera: Thripidae) resistance to insecticides in coastal California greenhouses. J. Econ. Entomol. 85: 9-14. Jensen, S. E. 2000. Insecticide resistance in the western flower thrips, Frankliniella occidentalis. IPM Reviews 5: 131-146. Murphy, B. C., T. A. Morisawa, J. P. Newman, S. A. Tjosvold, and M. P. Parella. 1998. Fungal pathogen controls thrips in greenhouse flowers. 52: 32-36.